Happy Tuesday friends! Today I have amy sweet girl Tammy guest posting about her summer sandal must haves! Check it out! SUMMER! It's official! Memorial Day weekend kicks off my favorite season of the year. Someone who names their daughter Summer is obviously a warm weather lover! For me summer is the beach, swimming, late nights outside sipping margaritas, maxi dresses on repeat and open toe sandals until at least the end of September. 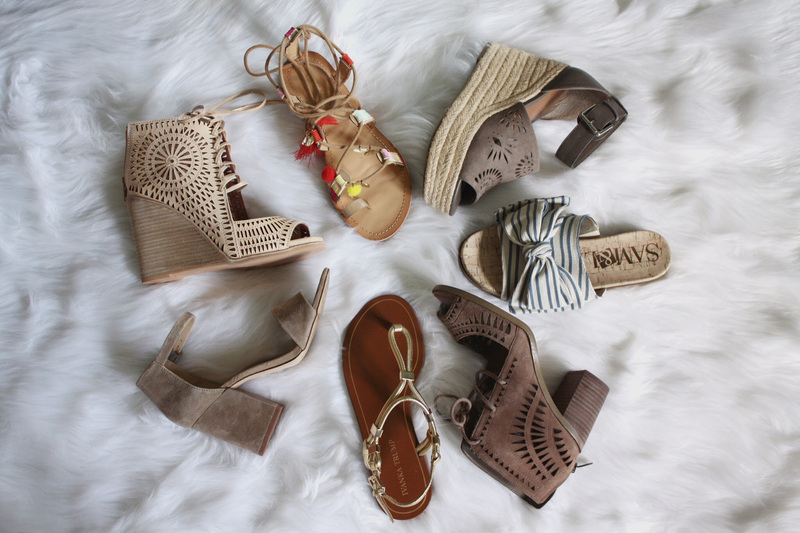 While I love flip flops because let's face it, they are easy and comfortable, there are so many must have sandals to add to your closet this summer. I thought it would be fun to do a shoe roundup showing you the ones I couldn't live without. These are the ones you'll see on House of Leo Blog all season long. Keep in mind almost all my shoes are comfortable because as you know I cannot deal with shoe pain. There's such a thing as sacrificing pain for beauty, but let's get real. There are far too many great shoe options out there that it's not necessary to suffer. You can totally have drool worthy shoes on and not be cursing under your breathe! This trend started last year but it took me a little while to jump on board. Once I did I was kicking myself for waiting! The block heel is clearly comfortable. Nice support for the heel and I love the little retro feel they give. If you hate stilettos (like me) but want a dressier heel this one is for you! I love the suede option. Gives a nice soft look and can be worn well into the fall. Laces are back. I love these because they intertwine laces and the block heel. The laces add some interest to the shoe whereas the block heel above is just a very sleek, simple look. I would pair the lace heel with a plain dress to add a little extra oomph to your outfit. These are beyond comfortable for being on your feet all day. Nothing says spring and summer like espadrilles. Seeing straw on shoes makes my heart race! Seriously! I remember I had these Old Navy espadrille wedges 10 years ago that I wore into the ground. It's not often that I'll actually wear a pair of shoes to the point of needing to be thrown out because they look so worn! The only one in our household that does that is Summer, haha! But she's 4! These espadrilles were a huge score. They are dupes for ones that retail for $170. I found these in my beloved Marshall's for around $30. They are high but so comfortable. They are more a platform than wedge which makes the higher lift comfortable for all day wear. Ok I lied. I did wear out another pair of shoes to the point of embarrassment. They were gold Steve Madden flats and I wore those babies with every maxi dress and skirt I had for probably 4 summers in a row. I love gold accessories. Gold jewelry and gold shoes. Gold serves so many purposes. Can dress you up, add edge, or add a boho feel. These gold flats have such a sleek look to them. They aren't overly shiny and they look great paired with long dresses and skirts. These were one of my favorite scores this season from Target. These are dupes for a pair that retail for $80. They are super trendy so I didn't want to spend that much on a pair of shoes that I know will be out of style next year. I love wearing these in place of flip flops. They are super casual but will definitely get the attention of others when you wear them. Gladiator is still going strong! It's gotta be about 4 years now that I have seen gladiator styling in shoes. I love these because they have the on trend pom poms on them along with all these other cute little trinkets. You can lace these up your leg or tied around the ankle as seen here. I got these at DSW for under $35. And that's a wrap for my must have sandals for summer 2017! So get those pedicures done and let your toes finally breathe in some of these fun picks! Which ones will you add to your closet?